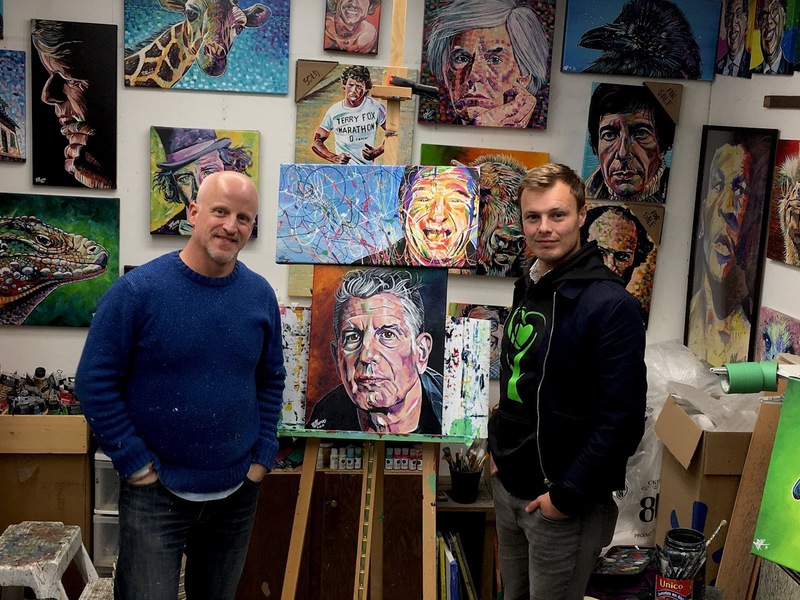 I was driving back from Edmonton on the morning that Anthony Bourdain died. When I'm driving I listen to the radio, always CBC 740 as the signal survives the long stretch between the capital city and Fort McMurray. 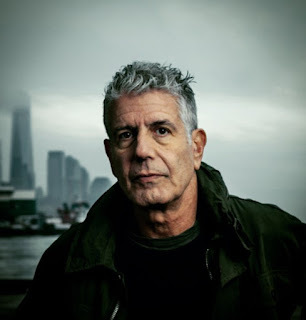 The coverage was wall to wall about the suicide of Anthony Bourdain. Several things were obvious. First, that he was a much larger public figure than I ever could have imagined. We don't have cable and I've never had the privilege of watching any of his shows. Second, that his decision to end his life was unexpected and had shaken many people to their cores. 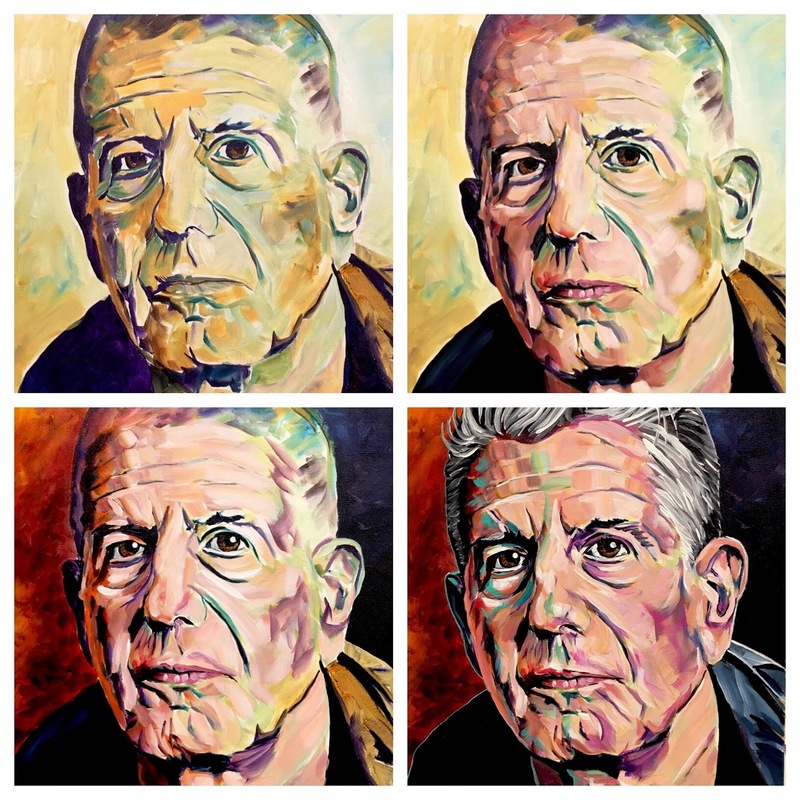 While I had no immediate plans to paint his portrait, I remember thinking to myself that almost every picture of the guy was what I would call "paintable". He was very striking in every single instance that a camera was pointed in his direction. It was the following day that suggestions starting coming in that I should consider painting his portrait. It had been a long time since we painted a human's portrait in my workshops. For some reason, most of our subjects ended up being animals. 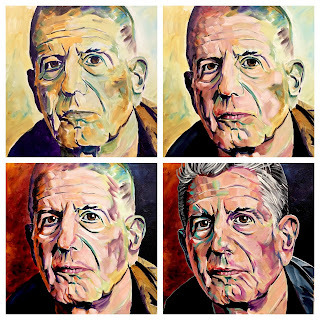 It felt right to return to the human face and Anthony Bourdain was the perfect subject choice on Sunday afternoon. Christina and Raya were my guests in Birdsong Studio. 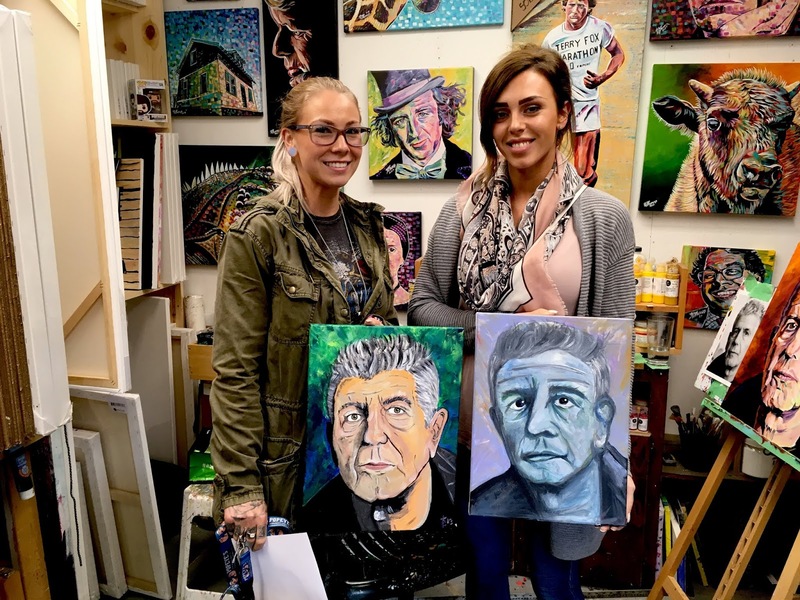 For both, it was their first time trying a human portrait. 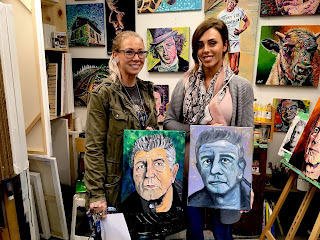 They did remarkably well, creating absolutely unique paintings of the famous chef and author. I took a break for dinner, then returned to the studio to continue my journey with Mr. Bourdain. I finished up the final details on Monday morning. As requests started coming in to buy the original (it was immediately scooped up by a local collector of my work), I started thinking about what to do about the demand for prints that was likely going to follow. The death and the subsequent painting felt similar to what happened after Robin Williams died. 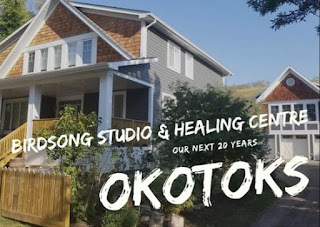 In that case, it seemed natural to raise money for Some Other Solutions (SOS), as they operate and manage the local 24-hour crisis line (780-743-4357 or 780-743-HELP). My heart and head were leaning in the same direction when I got a note from Justin Shaw, one of the team members at SOS wondering if I would be open to helping them help others. Justin dropped by Birdsong Studio yesterday to confirm the details and within the hour we were off and running with print sales. We did a short video explaining why this was happening, which you can watch above. We will only offer 50 gallery canvas prints (16" x 20") of this portrait. Each print will be numbered and signed. Net proceeds will be donated to Some Other Solutions to support the work they are doing to help people in crisis. Twenty percent of those were reserved in the first few hours. 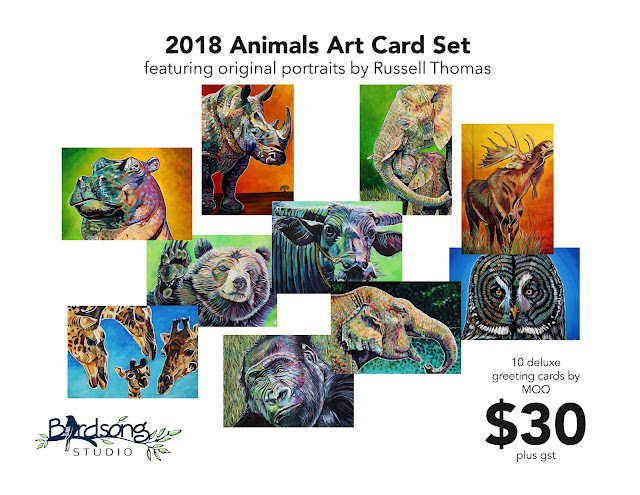 If you want to reserve one of these prints for yourself and support the work of this important charity, send me an email at russell.thomas@birdsongconnections.com.